I love the sound of rushing water. For me, it's relaxing and peaceful. The sound of rushing waters remind me of my childhood days when we go to the falls to swim and play with my friends. I have a table top fountain that my friend gave to me and I love using it at home. I also would like to have wall fountains because it's a unique and attractive decor that provides the soothing sound of running water which is also relaxing, enjoyable and a pleasure to look at. So if you are thinking to have a beautiful decor, try wall fountains. The sound of rushing waters will help you relax. I agree. 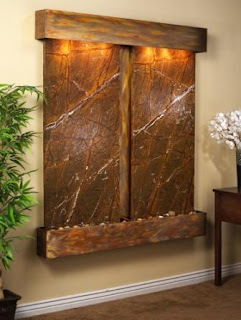 Mounted wall fountains are definately a great way to add a beautiful and relaxing aesthetic to any room. I just love the sound of water.